I’m cheap. I don’t like to spend a lot of money dining out. It infuriates me when I order steak and pay the hefty price tag only for it to arrive burnt or over cooked. I’m not a food connoisseur and I couldn’t tell you the first thing about cooking, but I do know my medium-rare Filet Mignon. I also know good service and if I’m at a high end restaurant, I expect it. It should be the standard but it’s not. I visited Flagler Steakhouse at The Breakers tonight and I had heard fantastic reviews. From the moment I walked in the door until I left, it lived up to the hype. My Filet Mignon was worth every penny, the service was the best I’d received in years and the setting was picturesque. I’m booked for The Italian Restaurant (the actual name) tomorrow night but I might change my reservation to Flagler Steakhouse again just to have the perfectly prepared Filet Mignon or to chat with Christine the waitress; the way she interacted with Athena was like she knew her for years. I always find something to say that a restaurant just isn’t worth the cost, but Flager actually is worth every finger-licking cent. We arrived at 5:45 pm and the restaurant wasn’t very busy. I like to get there early when the staff have more time for us and it’s more child-friendly. We were seated near the window indoors and our waitress, Christine, approached the table almost immediately. She heard Athena say that she wanted Mac & Cheese and even though it’s not on the menu, she quietly asked me if that’s what I wanted for Athena. It impressed me because it gave me the choice to decide for Athena rather than just assuming it was ok.
Once I said it was fine, she put the order in immediately. Again, I was impressed. Don’t all waitresses and waiters realize that children are not as patient when it comes to food? If you make them happy quickly, parents can enjoy their meal so much more and they are more likely to stay longer and maybe even order dessert. She also brought “crazy sticks” for Athena. They are short colorful sticks that can be shaped into different things. I had never seen them before but Christina opened them up with Athena and made a bracelet with her. The restaurant wasn’t busy but the extra effort she put into making us happy was amazing. 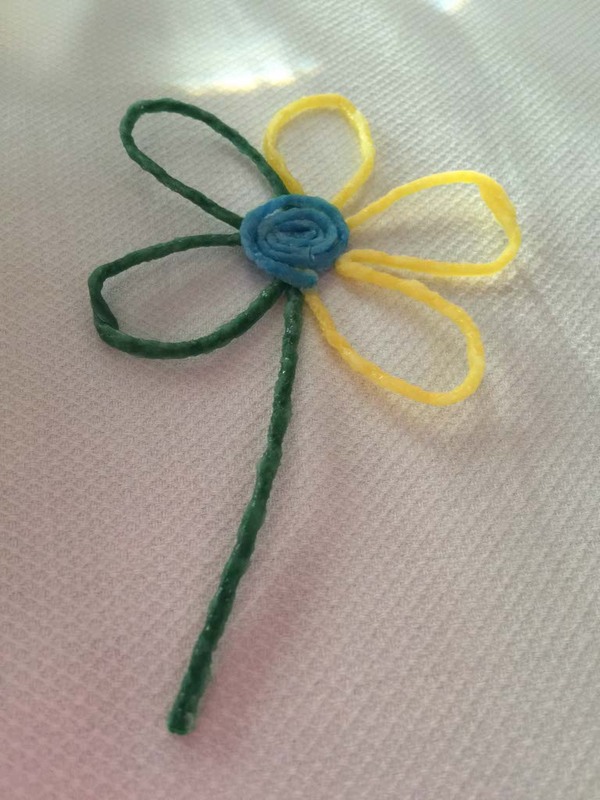 While we were dining, she also made a flower with the crazy sticks and wiped Athena’s hands when they were sticky. It was like having a nanny at the table helping me out yet she was never too pushy. She seemed to always be at the table at the right time. Athena’s Mac & Cheese came out quickly. It was the perfect temperature for a child and Christina brought a small spoon and fork so Athena could choose which she liked best. Athena was completely happy with her meal and the personal attention. 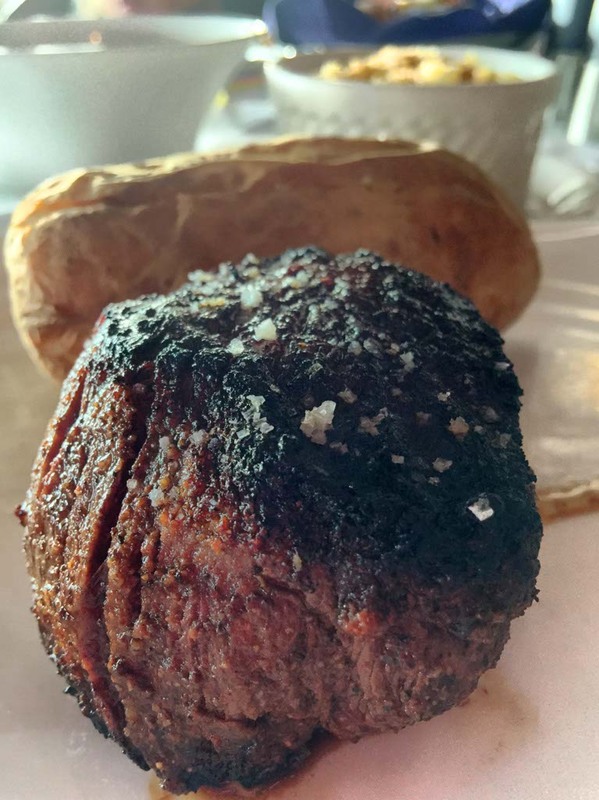 I ordered the Petite Filet Mignon with a baked potato. I almost went with something else because after a week of ordering steak in Palm Beach and it never coming out just right, I was discouraged. I’m so glad I decided to give it a chance. After the first bite, I wanted to personally thank the chef myself (although I didn’t). The outside was seared to perfection without a hint of burnt taste while the inside was tender and juicy. The only other time I had such a perfect steak was last year in St. Thomas. I remember it so well because the perfect steak is not easy to find. I savored every bite and I’m still thinking about it. 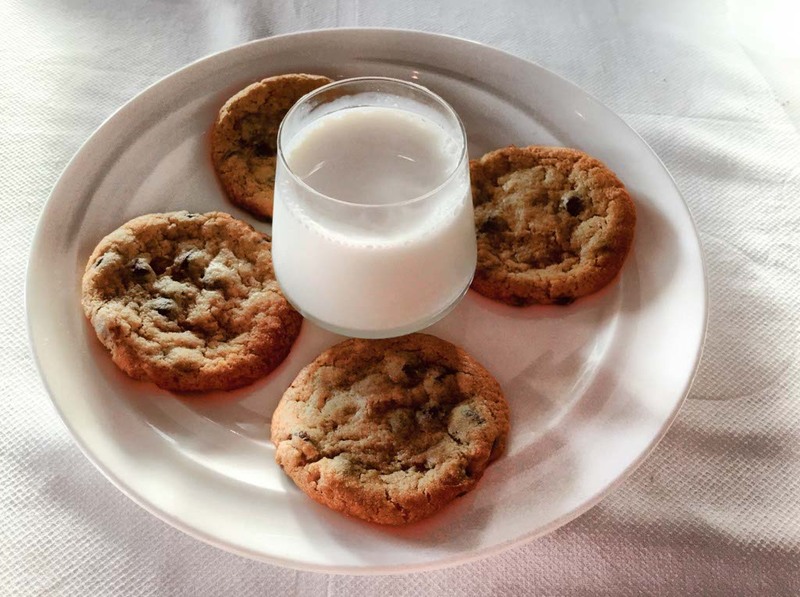 We finished off the meal with a plate of freshly baked chocolate cookies and a glass of milk. We could only eat one each so we shared them with a couple at the table next to us. They melted in our mouths and left us with sweet memories. I often judge food by how far I’d be willing to walk to get it… like I’d walk a mile for The Habit. I’d walk five miles in the Florida rain to eat at Flagler again. They should teach a class on cooking Filet Mignon and if I ever win the lotto, I’m coming back to ask Christine if she wants to be Athena’s full-time nanny. We need more high standards like this in the service industry. 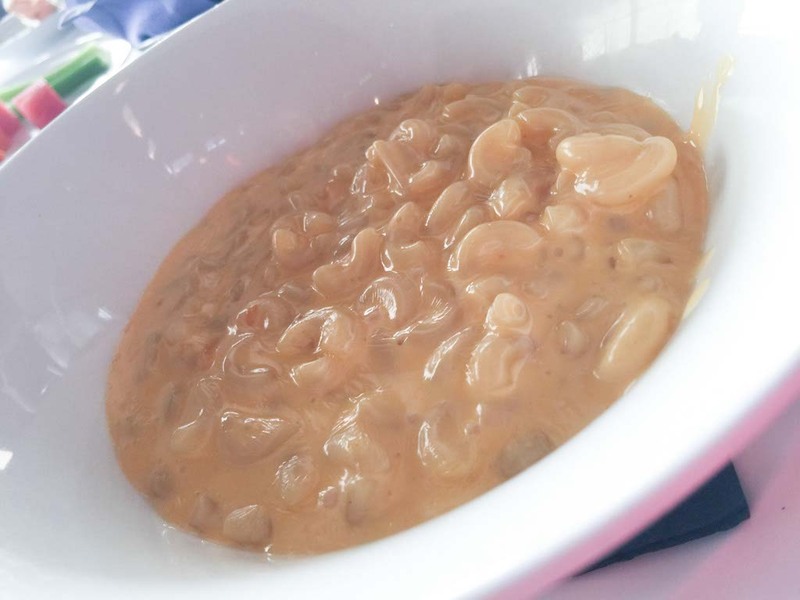 This entry was posted in Family, Family Travel, Florida, Luxury Travel, Restaurant Reviews, Reviews, Travel, USA and tagged Dining, Flagler Steakhouse, Florida, Palm Beach, PalmBeachesFL, restaurant, The Breakers, travel by lesleycarter. Bookmark the permalink. That Filet is gorgeous. Is that a topping or crust on it? I like mine ‘charred rare’ or well-seared on the outside. It’s a topping I think because it didn’t have that burnt taste. Do you like it a little burnt? I find that ruins it for me. Funny how everyone likes something just a little different. Do you ask for it that way? I’m with Felicia. I try and leave a compliment with the sup if the service is about standard. It sounds like you both had a wonderful experience. Sounds like an amazing place! Yes Leslie you were at the right place! A nanny at the table–now that’s service! Sounds like a great place and a wonderful experience all around. That filet looks phenomenal. But on top of that, the care and hospitality that Christine showed Athena is absolute gold! Love that they took the time to make your experience a wonderful one at all levels. That’s a restaurant – or at least a server – that knows it’s all about people! That filet looked absolutely luscious! My type of meal! Is anyone else craving like a carnivore after this post? 🙂 And I also could stand to eat a chocolate chip cookie myself, LOL!